Getting a sense of average weather conditions in Paris in any given month is an essential step in planning your trip to the city of light. Paris experiences a temperate climate that is primarily influenced by the Atlantic Ocean. Winters are cold (but not typically freezing) and pleasantly warm during the summer without being scorching. With occasional influences of Arctic air mass and warmer winds from North Africa, there are also times when the city can be very cold or very, very hot. The city doesn't receive extreme amounts of precipitation. There are more rainy days throughout the winter, but accumulations are higher during the summer months when intense thunderstorms are common on hot, muggy days. Snow can occur, but is rare and doesn't usually stick. Typically, the best time to visit Paris is from May through mid-September. Mid-May through June is especially pleasant, with long days and milder temperatures. Spring, while beautiful, can be quite chilly. 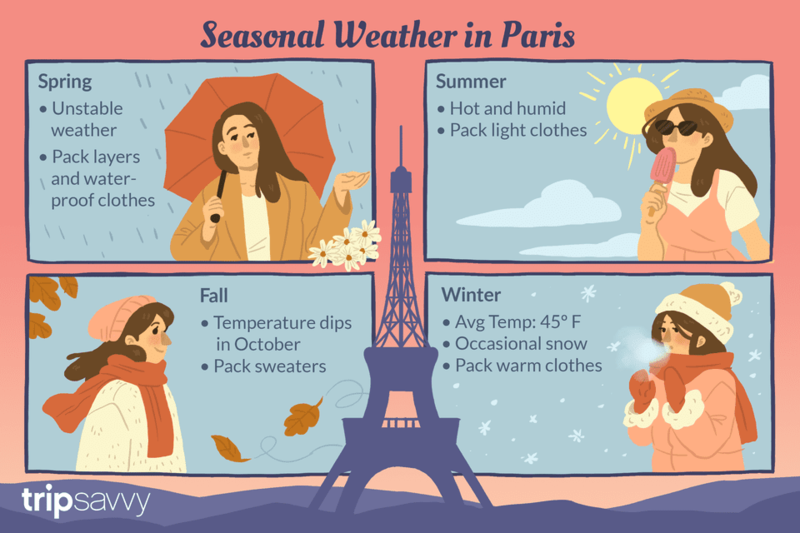 Read on for more information about Paris's climate as well as a season-by-season breakdown of the weather. Spring in Paris is largely unstable, with temperatures ranging from pleasant to quite cold. Short snowfalls can even occur in March. There's even a saying "En avril, ne te decouvre pas d'un fil," which means, "In April, don't take off even a thread." It can still be chilly, with unpredictable gusts and showers. By May, a true thaw is underway, to the delight of all. Still, it can be an extraordinarily rainy month. What to Pack: March brings a slight thaw, but not enough to go sleeveless. You'll still need plenty of warm sweaters, plus waterproof shoes and a jacket. Pack layers, and make sure to keep those waterproof clothes and shoes on hand. Midsummer in the city of light is moderately warm and gorgeous—or muggy, hot, and humid. August is, like July, punctuated by sunny, hot times and humid thunderstorm conditions. The days are very long, with occasional cool and rainy days. On other occasions, temperatures can sometimes exceed 85 F, although this is not incredibly common. What to Pack: June brings much warmer temperatures, but a lot of rain, too-- including surprise thunderstorms. Pack your suitcase with layers, and make sure to bring a raincoat or umbrella. Lots of T-shirts and open-toed shoes are recommended to keep from sweltering, especially in the Paris metro. To keep from overheating, pack light clothes in natural fibers like cotton or linen. September is only marginally cooler than July and August—and sometimes sees Indian summer conditions. In the fall, you'll gradually see temperatures drop and an increase in rain and clouds. It typically cools down in Paris in November or late October. What to Pack: Temperatures start to dip considerably in October, so pack sweaters and warm trousers or dresses for colder days, and lighter items for the oddly warm and sunny one. And again, always have waterproof clothes in your suitcase for the rainy days. During winter, average temperatures typically hover around 45 F, but there are occasional warm days where temperatures in the upper 50s aren't uncommon. Similarly, there can be strikingly cold periods due to air masses from Russia. Occasionally snow, albeit not abundant, can occur, along with frost. What to Pack: Cold and often crisp, winter in Paris demands warm and waterproof clothes.